Yes, you’ll need to rise before the Sun to see this spectacle. We normally target an hour after sunset for our astronomy lesson, which is convenient for most people, but sometimes the best views are early in the day. 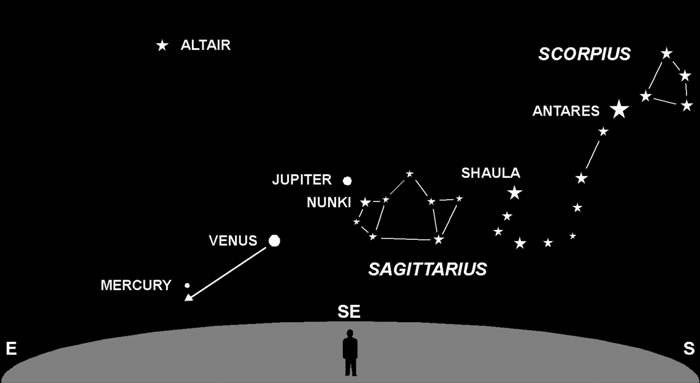 For most of this month, the planets Venus and Jupiter have been shining beacons in the morning sky near the “Teapot” constellation Sagittarius. During the last half of the month they’ll be joined by elusive Mercury. The chart above shows their February 16 positions. If you watch over a period of a few days, you’ll see Venus slip east (arrow), passing very close to Mercury on that date. The word conjunction has a technical meaning related to astronomical coordinate systems. If you’re curious, look here. For the casual observer, suffice it say this means the planets will be very close. For the best view, find a clear horizon not blocked by mountains or buildings, as this trio is fairly low in the sky. Venus and Jupiter are especially bright; Mercury will be about as bright as the stars of the Teapot. Next Next post: Good Dog, Want a Treat?